Max was happy to return to the hills overlooking the irrigation canal this morning. Our walk felt so invigorating and it was fun to observe the changing vegetation and the variety of things in bloom. After that, I visited the Women-In-Need shop and dropped off a whole number of boxes and bags filled with objects that I had no need to hold onto any more. Before leaving the store, I found three lovely drawings done in graphite, pen and paint, all three signed by an artist named Crawford. There was a sticker on the back side of one piece, telling me that at one time they were owned by a Paul H. Kahler of St. Clair, Michigan. Now, as always, I wondered how it was possible that these well-executed pieces should land in a shop in Canada’s west and so of course, I began my investigation. I went in search of an artist named CRAWFORD coming out of Mr. Kahler’s city. Sure enough, this is what I found, taken directly from The Voice, serving Northern Macomb and St. Clair counties dated November 28, 2011 and written by Jim Bloch. 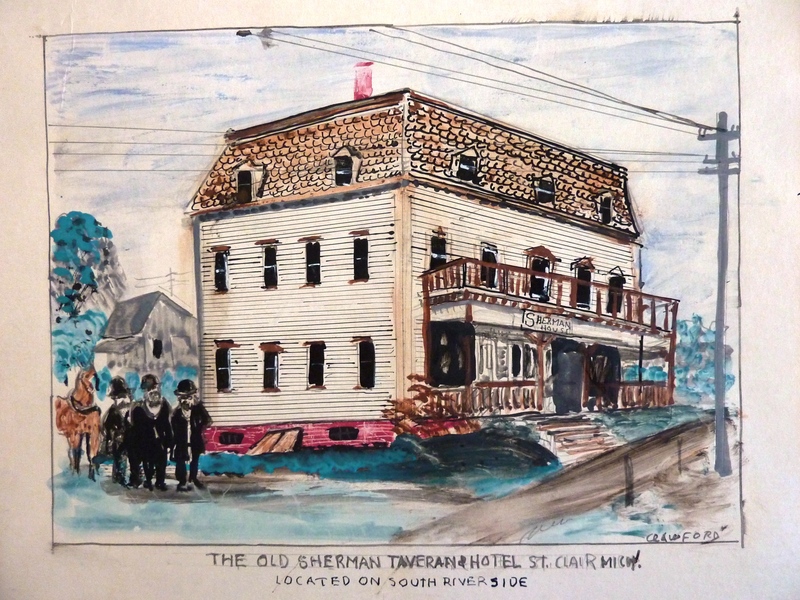 The photograph illustrating the article was in the very same style as the three pieces that are now in my possession…The Sherman Hotel, The Sherman Hotel and Tavern and Strauss & Sons Grocery Store, located on Riverside & Trumble. Sam Crawford may have died nearly a quarter of a century ago, but his paintings continue to speak to the residents of St. Clair. After all it is the riverfront town from which he drew the majority of his subjects. Bigger presented “John D. ‘Sam’ Crawford: St. Clair History through Art” at the St. Clair Historical Museum on Nov. 18 in front of a full house of more than 60. Bigger’s comparison of Crawford to Grandma Moses, perhaps America’s most famous primitive painter, is instructive. Grandma Moses, 1860-1961, did not begin painting until she was in her late 70s, after arthritis made it too difficult for her to continue embroidery. She burst onto the public art scene in 1940 – two years after a New York City art collector discovered her work while driving through her hometown in upstate New York. Technically untrained, she painted colorful, highly detailed rural scenes that seemed to capture American innocence more innocently than even Norman Rockwell. No New York art collector discovered Crawford but, like Grandma Moses, Crawford did not seriously commit himself to painting until late in his life. Most of his work was done after he retired from the Diamond Crystal Salt Company in 1968 following a 49-year career, much of it spent as a hi-lo driver. Although formally unschooled, the Diamond recognized Crawford’s ability and he painted a number of safety posters for the company. Born in 1900, Crawford, like Grandma Moses, witnessed dramatic changes in his little pocket of the world. The Langell Shipyard, which produced giant wooden steamships on the Pine River, was closing as Crawford was born, said Bigger. He saw the Oakland Hotel, which attracted international visitors for its mineral waters in its heyday and witnessed its decline. He watched trains, trolleys and horse-drawn wagons give way to automobiles. “Sam watched the Pine River Bridge being opened manually,” said Bigger. He was the eighth of nine children, growing up in a home on South Tenth Street, near Cedar Street. Grandma Moses was one of 10 children. Her life stretched from the Civil War to the Cold War. “Sam said he practiced his art on his mom’s walls,” said Bigger. Moses sold her paintings in store windows in Eagle Bridge, New York, for $2 and $3 a piece before the art collector stumbled upon her. Crawford’s best work exhibits the same kind of attention to detail and vivid coloration seen in Grandma Moses’ paintings. In general, his work represents a much sharper sense of perspective than hers, especially in his detailed pen-and-ink sketches. Crawford’s work also has a political dimension largely absent from hers. 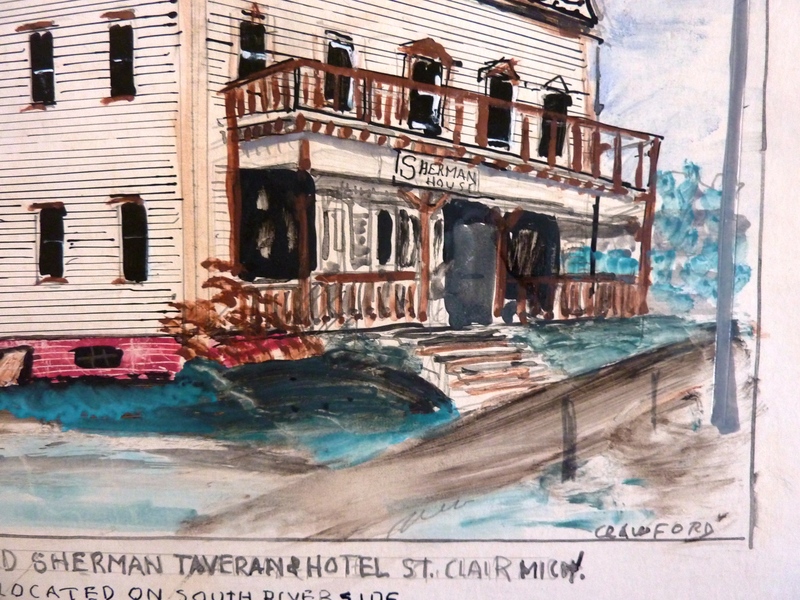 The coming of urban renewal to St. Clair in the 1960s, when the old downtown was razed and replaced with Riverview Plaza and Palmer Park, seems to have been the watershed event in Crawford’s artistic life. So much of the town of his birth had already been erased by the vast technological changes of the 20th Century. Now the town itself, its buildings, the physical embodiment of the hard work of its families, its history, was being demolished. 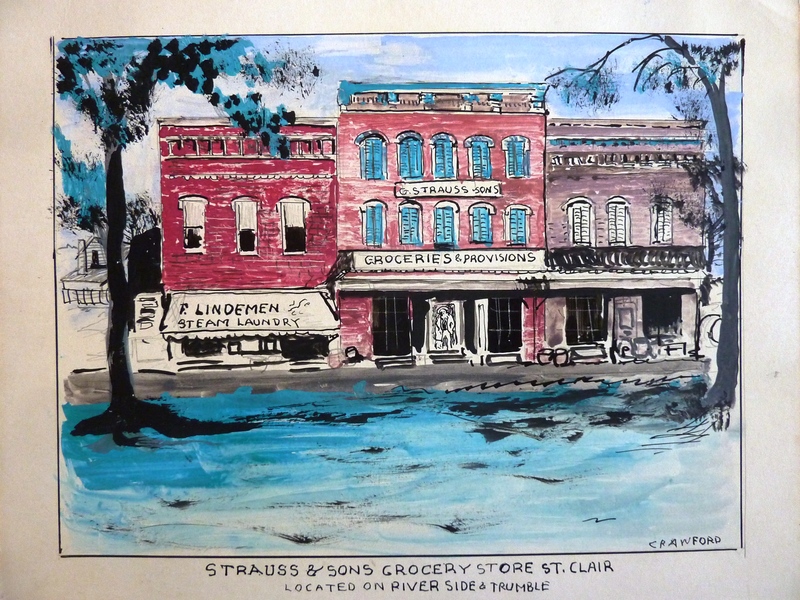 Crawford began cataloguing the old town in pen-and-ink, watercolor and acrylic, providing an eloquent time capsule in the face of the bulldozers. “He watched the destruction of old St. Clair,” said Bigger. He recorded the demolition of the old town and made his political opposition to urban renewal known through his art. 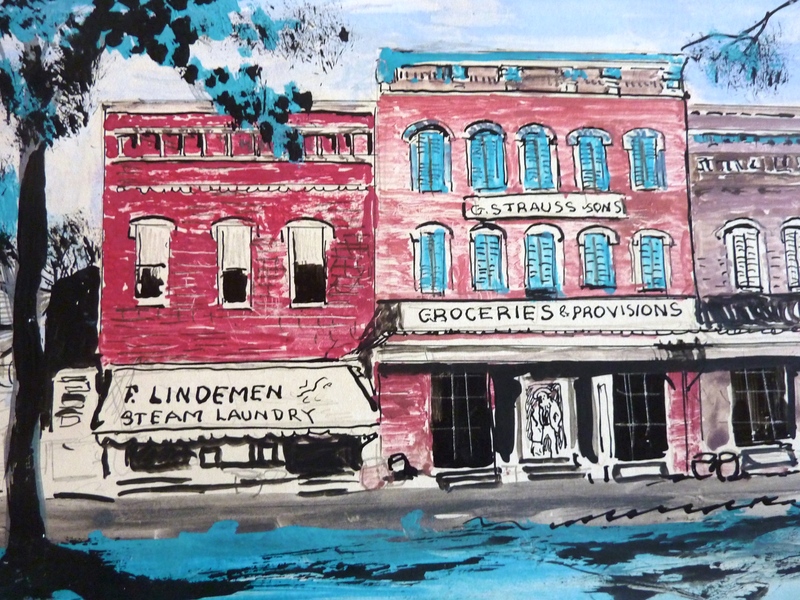 One of his paintings portrays the city dump piled high with the signs of disappeared businesses – Beck’s, Toyland, Gamble’s, Gleim’s butcher shop, the Shrimp Boat, and a dozen others. In a painting of the old downtown movie theater, the St. Clair, the marquee says, “Auction Sale Sat. 1 p.m., Equipment Furniture & Clothes.” There’s a “Closed” sign on the window of its ticket booth. Instead of a movie poster in its glass showcase, a sign reads “Closed due to urban renewal.” The painting is titled “Gone but not forgotten” and dated February 1968. The destruction of the old downtown, the centerpiece of his life, seems to have pushed him to recreate the town’s entire past in paintings, going back to Fort Sinclair and its founder, Patrick Sinclair, in 1765. Crawford used postcards, newspaper photos and his own memory in an almost feverish attempt to catalogue the city’s history in his art. 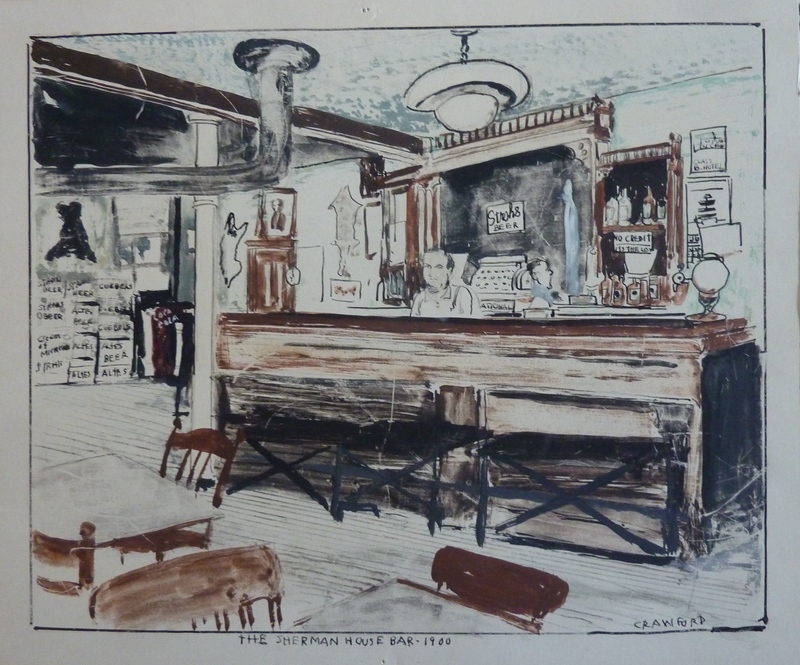 Crawford painted everything – mayors, businessmen and businesses across the generations; the Surprise Theater, St. Clair Hospital and the old library; railroad magnate Mark Hopkins; the old city hall before and after its majestic pillars were added; the outdoor pool soon after it opened in 1955, the city’s eight saw mills from the mid-1800s; the Kemp Coal Yard where the Voyaguer stands today; Sheldon Tanning; the Michigan Central Railroad curving into the south end of town from Richmond on a trestle near the current Dairy Queen; the Tashmoo cruise ship, which used to call at the Star Line docks at the foot of Witherell Street, one of its 90 stops between Detroit and Port Huron; local men cutting ice on the Pine River; the Somerville Hotel located on the town’s north side about where North Riverside Avenue now narrows from four lanes to two; Shinske’s Grocery on Vine and Fourth Street; Lee’s Bar, also known as the Snake Pit; and the old downtown Burkhart’s Bar with its last proprietors, Kenny Klieman and Bill Cedar, father of the city’s current mayor, tending bar. Crawford died on Nov. 20, 1987. The historical museum, 308 S. Fourth St., owns perhaps the largest collection of Crawford’s work. It is open on Tuesdays, 9 a.m. to noon; Saturdays, 1:30-4:30 p.m., and by appointment. His work can also be seen in attorney Ron Allen’s office and in almost all of the city’s bars and restaurants. A number of residents brought their personal Crawford paintings to Bigger’s presentation.